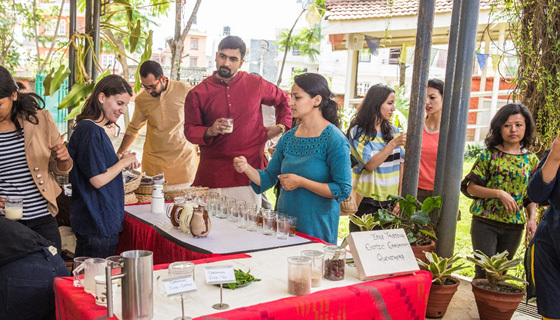 Dubbed Cardamania, the launch of the drinks under brand Himalica–Green Products from the Mountains attracted a huge crowd of people to the stall. A choice of four drinks was on offer: cardamom infused fruit punch, iced tea, iced coffee, and mango milk shake. The objective behind creating these drinks is to create a market for value added cardamom products in Nepal so that cardamom farmers in Taplejung can develop value added products rather than sell cardamom pods in crude form. At the fair, the Brazilian Ambassador to Nepal Maria Teresa Mesquita Pêssoa visited the Himalica stall and tasted the cardamom drinks. ICIMOD staff and visitors from outside the organization who had come to celebrate IDBD also thronged the stall to taste cardamom drinks. Everyone was very keen to taste the beverages which feature a unique blend of ingredients. Unsurprisingly, the drinks were a huge hit. They were all snapped up in no time and more had to be concocted on the spot. The strategy to promote Himalica products made of large cardamom sourced from pilot sites in Taplejung by offering free tasters clearly worked. 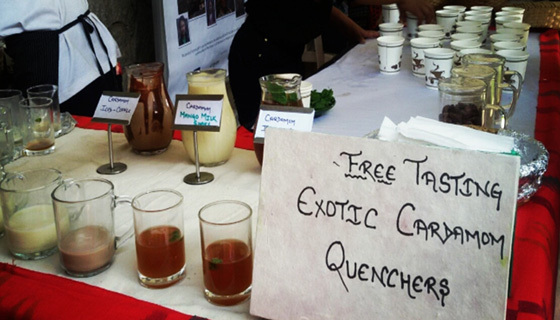 As rated by tasters, cardamom iced tea was the preferred drink of the day, followed by cardamom iced coffee. The cardamom fruit punch and cardamom mango shake also delighted many who prefer fruit based drinks. The drinks were sold at the ICIMOD canteen on the day and are now featured on its regular menu. They will be also be marketed through SABAH Nepal's Village Cafés. Cardamom biryani and cardamom kheer offered as lunch items that afternoon at the ICIMOD canteen were also big hits. There is a plan afoot to design a menu of cardamom based items and promote them through outlets and restaurants in cities in Nepal. SABAH Nepal is due to start promoting cardamom based products in Pokhara, Bhairahawa, Taplejung, Biratnagar, and Birgunj. At the IDBD event, Eklabya Sharma, Deputy Directior General, ICIMOD, commended the branding done for mountain products such as cardamom and said that he was happy to see that private sector linkages are helping promote mountain products, which will in turn support the livelihoods of mountain communities in the Hindu Kush Himalaya. At their stall, SABAH Nepal presented products featuring the Himalica and Kailash brands. The Kailash brand ties together products sourced from the Kailash Sacred Landscape through ICIMOD’s transboundary Kailash Sacred Landscape Conservation and Development Initiative (KSLCDI). Cardamom, spices, purses, bags, allo products, beans, and ghundruk were among the products on display. Similarly, another stall at the fair, managed by Kanpou-Nepal Pvt Ltd, presented handicraft including notebooks, lampshades, paper, and fans made from value added argeli bark. Jamarko, another private sector entity, promoted handicraft recycled from waste paper, and ICIMOD featured honey products.